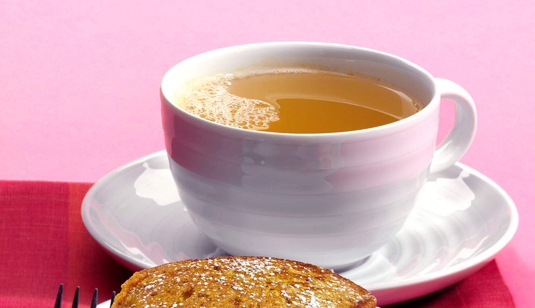 Warming, invigorating ginger has long been used as a kitchen remedy for nausea, morning sickness, and motion sickness. This tea also serves as a cold and flu treatment. Peel the ginger and slice it into coins about the thickness of a quarter. Bring the water to a boil in a small saucepan. Add the ginger to the water and reduce the heat to low. Cover and cook for 10 minutes. Remove from heat. Squeeze the lemon juice into the ginger tea and whisk in the brown rice syrup and cayenne. Strain the tea through a fine-meshed strainer into a mug, saving the remaining tea. Adding fresh lemon and cayenne adds a kick of immune support and feels great if you have a sore throat. Per serving: Calories 7 (0 from Fat); Fat 0g (Saturated 0g); Cholesterol 0mg; Sodium 1mg; Carbohydrate 2g (Dietary Fiber 0g); Protein 0g.